Brad formed a love for drag racing as a child, and his memories of racing begin when drag races were held at local airstrips, with temporary timing clocks set up the day of the event, and taken down when the race ended. Brad started drag racing at 22 years old. His first drag bike was a 1975 H-2 Kawasaki that he built himself. This progressed to a few Kawasaki Z-1/KZ bikes, and then to a C/Gas Kawasaki powered laydown dragbike which in 1978 he set the International Drag Bike Association (IDBA) C/Gas MPH national record. That record was retired 5 years later. 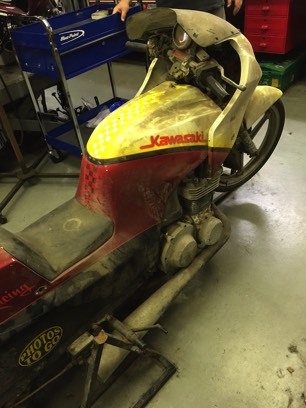 Brad sold the laydown in 1979 to build a pro stock bike that he raced from 1980-1985. 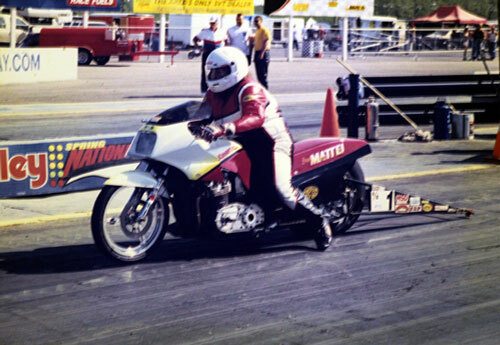 In 1985, due to the start of Mattei's Cycle Supply and the birth of his son, Seth, Brad stepped away from racing until 1990 to help customers and other racers. In 1990 Brad started building another IDBA Super Eliminator bike. Super Eliminator is comparable to NHRA's Competition Eliminator. With a business, a son, and the details of managing a "normal" life, the bike was finished in Fall 1993. It was built specifically to run in IDBA Modified classes. It was a 1985 Ninja-bodied, KZ Kawasaki powered, Mattei-framed success from the beginning. After a few shakedown outings, the first local race Brad entered the bike in won. Then it was off to race the IDBA National circuit. The first IDBA race entered produced 4 national records (ET and MPH in both 1/4 and 1/8 mile) and a semifinal finish. The records set were taken from then current national champion. Brad raced the bike from 1994 to 2001 on the IDBA National circuit, setting 50+ national records, and always finishing in the top ten in points - with two #1 National Championships in 2000 and 2001. At that point Brad was also helping a fellow racer, Steve Smithers, who had built a Pro Mod bike to race in the ProStar racing series. Steve, his wife Patti, and his father-in-law Bob live in Olathe, KS. Brad would meet them at the ProStar national events. 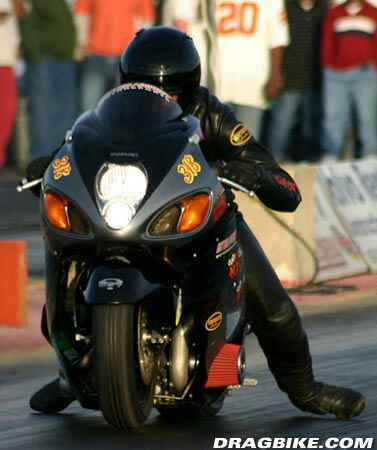 The Pro Mod bike was always a contender, and finished in the top ten in national points from 2001 through 2005. Running six second ET's at 195+ MPH. In 2005 Hurricane Katrina flooded Mattei's Cycle Supply with six feet of water in the building. For a year after the storm, Brad and his sole employee, Sean Slack, juggled time between rebuilding the store and servicing motorcycles in Brad's home garage. During that time, a local Texas Shootout racer named Keith Salles needed help on a quick rebuild of his 60" wheelbase turbocharged Hayabusa's engine. Keith won't admit it, but he is one of the most talented riders Brad has seen. Brad did what was necessary and Keith was able to make the final event of the season. Since then, starting in 2007, Keith and Brad have been friends and racing partners. While working with Keith, Brad has honed his skills on tuning both engines and various styles of drag racing clutches on motorcycles. This cannot end without the mention of a fantastic fabricator named Jesse Gonzalez. While Brad builds the engines and collaborates with Keith on the tuning, the beautiful bikes they bring to the track are a collaboration between Keith and Jesse. Jesse's father, himself, and his brothers are owners of Alex's Body Shop in Slidell, LA. This quick bio cannot be complete without the mention of my grandfather, Richard Mattei, who taught my father; who taught me. Last, thank you to my wife Kay and my son Seth. Without their help I could not do what I do. Special thanks to Bob Lutz, owner of "Try Me" Coffee - established 1928. Without his help I would not have won my two national championships, and Alan "Heavy" Jones and Jones Automotive, who showed me how race engines are machined the poor boy (Poboy) way.